A top searched wedding hair topic on Google is ‘wedding hairstyles for long hair.” If you have long tresses, you’re in luck, because you’ll find you have the most options for styling. If you’re searching for long hair #inspo for your trial, or are still searching for ideas, we have plenty of knowledge to share. Wondering what the best ways to prep your hair for wedding day styling? Here are three simple, no-fail ways to get your hair ready for your bridal hair style. We recently decided to add a Newsletter to our site! We did this to help keep you updated on future upcoming blogs and educational opportunities. We could not be more excited to kick this new adventure off with a recap of our last few blogs. You are not going to want to miss this, especially if you are a future bride or if you have general questions on hair and makeup for special events. We want our blog to contain education for all of our amazing supporters. If you are like me and hate filling in your eyebrows everyday and want them to be an even shape, I highly recommend this service. It definitely makes the putting on makeup process way easier. Or, if you are anything like my mom and sisters who plucked their eyebrows a little to much and don't have a ton of hair - this service is also a great option. It's been just about a week since my procedure, and I want to share with you all what my experience has been like. We get a ton of questions about hair accessories. I LOVE hair accessories, and think they add the perfect touch to the overall style. A lot of women will opt out and use only the veil. It really comes down to preference and your style. June is the most popular wedding month, kicking off the 'wedding season' as bridal and wedding professionals know it. With continuous heat waves and humidity-ridden temperatures in Dayton, it's the right time to talk about summer wedding hair styles. Are these really all that different from wedding hair styles in the winter or spring? You betcha. Wow, I am so excited to share these beautiful photos with you all. 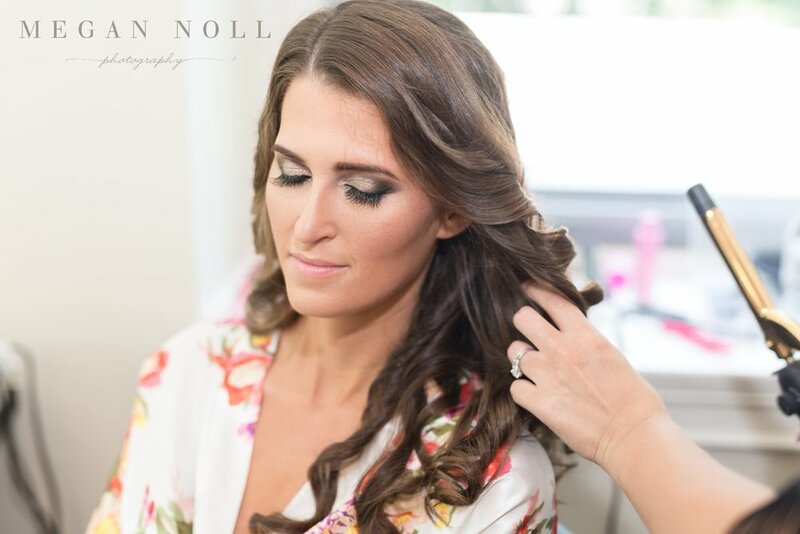 Katharine had booked her wedding hair with us about 5-6 months prior to the wedding and I was anxious to meet her. She has a crazy busy schedule so we arranged her trial a month prior to the wedding. When I met her and her mom I knew Katharine was going to have excellent taste. Her dress was STUNNING! She was so polite and had the most amazing natural wavy/curly hair. It was thick too! This is a hairstylists dream canvas if you didn't know. HA! Katharine and Brian had a really beautiful-Italian filled wedding. They are both Italian, so that was an obvious set up for their big day. Elya and I set up at the Monastery on the day of, in a private suite, with mirrors, chairs and lounging areas. It was such a beautiful private space. Thank you to Katharine for entrusting us on your big day! Loved getting to know you and your sweet bridal party. Xoxo Congrats!! Check out the hair and more below. Let us know what you think! Emilee and Wes had such a beautiful day for their wedding. The weather was perfect, the bridesmaids were fun and energetic. It was the perfect combination of everything! We showed up bright and early ready to go. Emilee was SO laid back and enjoyed every moment. I love how close her and her bridesmaids were. You could tell it was going to be an awesome day from the moment we walked in. The main area where we set up, was a bit dark, so the pictures I took on my little ole I phone didn't do the hair justice. BUT--- I received the professional pictures the other day and it was worth the wait! OH. MMMM. GEEEE.... You guys, I am in love. Her hair, the dress, their love! They are so adorable. Check out the pictures below and see why I am so excited to share. Thank you and Congrats again Emilee and Wes for having Sweetly Pinned Hair be apart of your BEST DAY EVER!